Unless you’re headed to the summit of Mauna Kea, a Hawaii Christmas is not a white one. Santa sheds his red suit in favor of flip-flops and a loud Christmas-colored Hawaiian shirt. While there may be a lack of wintry cold in a Hawaiian Christmas, there is no lack of holiday spirit and fun. 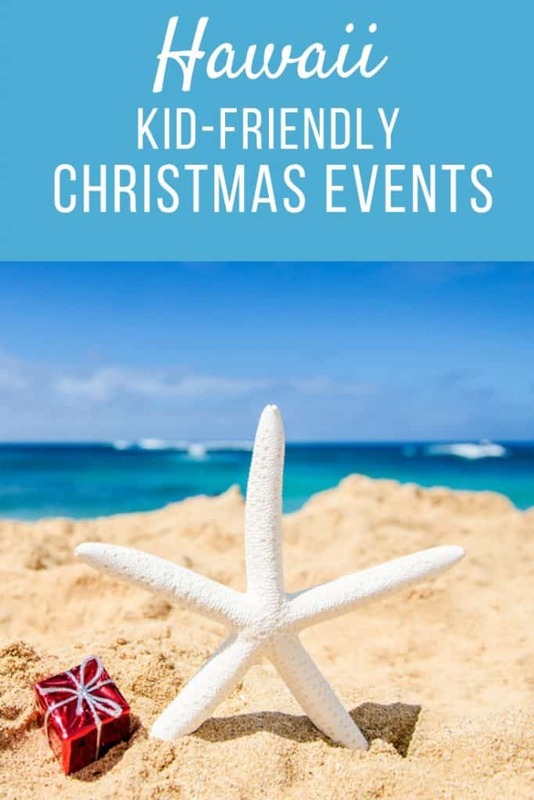 Here are our picks for kid-friendly Hawaii Christmas events that has everyone in the Aloha State exclaiming, “Mele Kalikimaka”! That’s Merry Christmas in Hawaiian, folks! There will be no shortage of music and lights for celebrating Christmas on the Big Island of Hawaii. The 34th Annual Kailua-Kona Community Christmas Parade rolls into the area. With approximately 75 entries and 7 announcer locations, this year’s theme, “A Storybook Christmas” is sure to be a colorful spectacle as it travels along the town’s main drag of Ali’l Drive. Do you need to finish up some Christmas shopping? Head to Kailua Village for a holiday stroll through the area and get special pricing at participating restaurants and retailers. Then unfold a beach chair or mat for a free holiday concert under the monkey pod tree at Emma’s Square. One of Kona’s newer traditions takes to the water that same evening with the 5th Annual Kalikimaka Boat Parade. Great viewing spots for Kona’s holiday fleet can be found at the Kailua Pier or any of the village’s many restaurants. Just because you’re traveling during Christmas time does not mean your family has to miss out on classic traditions like the Nutcracker or Christmas Eve services. The West Hawaii Dance Theatre & Academy accompanied by the Kamuela Philharmonic Orchestra presents a visually stunning family-friendly holiday festive production with more than 70 local dancers, and guest dancers from Bolshoi Ballet, Matsuyama Ballet, and Carolina Ballet. Christmas Eve services at Mokuaikaua Church, Hawaii’s first Christian church, feature the annual “Silent Night” hula during the candlelight portion of the service. Find amazing deals on family-friendly hotels on the Big Island. On the island of Oahu, the Christmas events include an array of colorful parades like the 22nd Annual Festival of Lights Boat Parade at the Hawaii Kai Town Center. 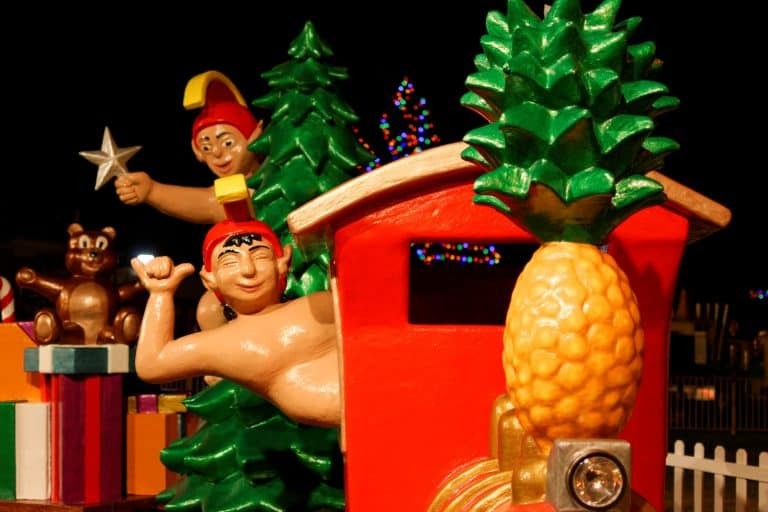 The biggest celebration on the island is Honolulu City Lights, the month-long festivities kick off with the lighting of the 50-foot Norfolk Pine Christmas tree on the front lawn of Honolulu Hale triggers the “corridor of lights” down King and Punchbowl streets. The event also includes an Electric Light Parade, live entertainment and festive displays. Santa arrives mid-month at the Outrigger Waikiki via canoe. 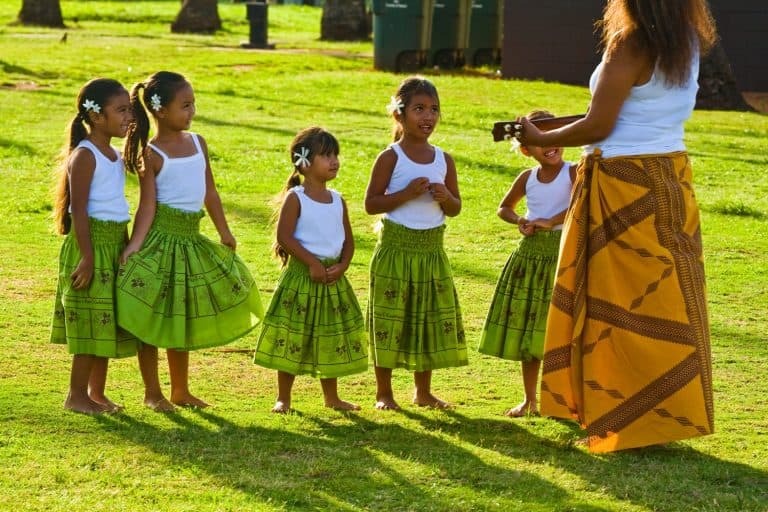 Keiki from Halau ‘O Pua Kahale greet him on the beach with the gift of hula. Holiday Hint: In this part of the world, Santa hopes you leave him Malasadas, not cookies. A Portuguese doughnut without a hole, a malasada is golden brown outside, light and fluffy inside. They are filled with the gooey goodness of custard, chocolate, or coconut and dusted with sugar. They are in fact so amazing, that there is a designated Malasada Day to celebrate them. Stop by Leonard’s Bakery to get introduced to his local favorite. 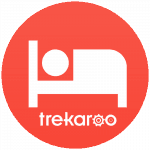 Check for great family-friendly hotels on Oahu. Celebrations on Maui kick off with the Banyan Tree Lighting in Lahaina Town. The massive tree and its tangle of branches are illuminated with thousands of lights. Santa also arrives on a Hawaiian voyaging canoe at Maui’s Grand Wailea. The resort also kicks off “Tis the Season of Aloha,” with a month of activities and programs, many of them benefiting local charities. Guests might find carolers strolling the lobby singing traditional and Hawaiian holiday songs. Special ukulele and hula performances are also part of the holiday season. Santa returns to the resort on Christmas Eve, and hundreds of children are expected to turn out to see him sail in on a voyaging canoe. At the Sheraton Maui Resort & Spa, families can celebrate Christmas Eve “Hawaiian style” at the resort’s oceanfront Maui Nui Lu’au. 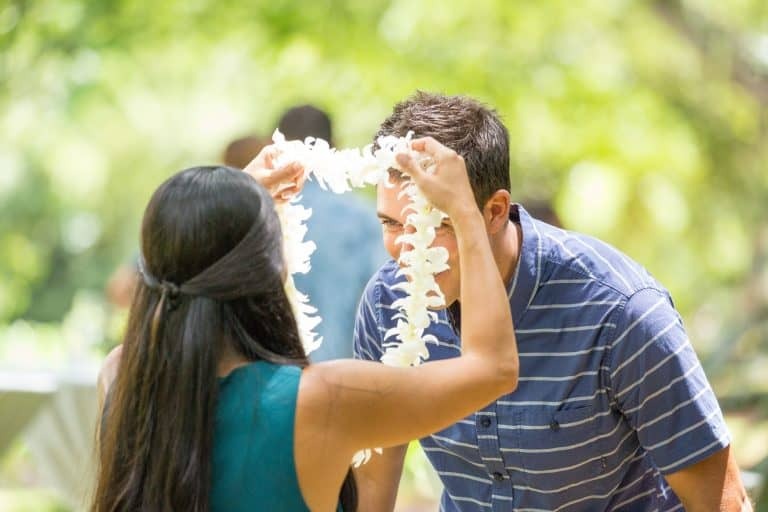 The entire family will delight in remarkable stories, history, and culture of the Valley Isle and Kaanapali luaus. 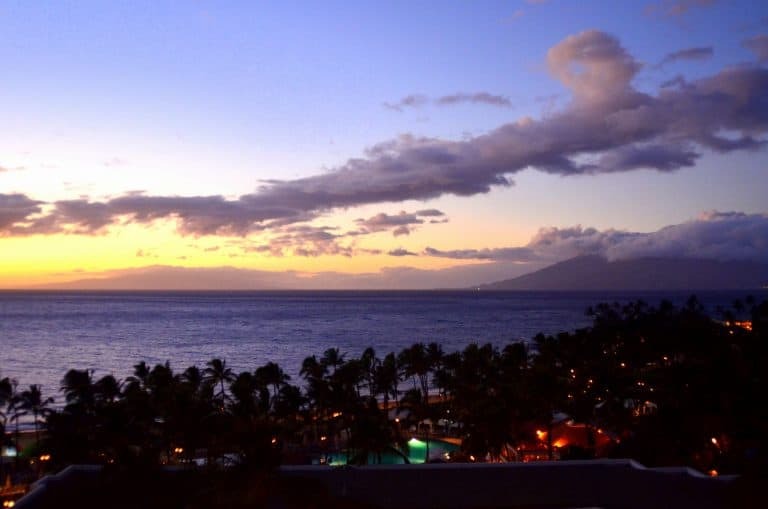 Check for availability at family-friendly hotels on Maui. If you find yourself on Hawaii’s Garden Isle for Christmas, do not miss the Festival of Lights display inside the historic county building. For more than two decades, Josie Chansky known to many locals as “Aunt Josie,” fills the place from floor to ceiling with unique holiday-themed decorations. How unique, you ask? Have you ever seen a tree made of 7500 green toothpicks or wreaths made of plastic egg cartons? Referring to the old adage, many of the amazing displays here became another man’s treasure after being another man’s trash. 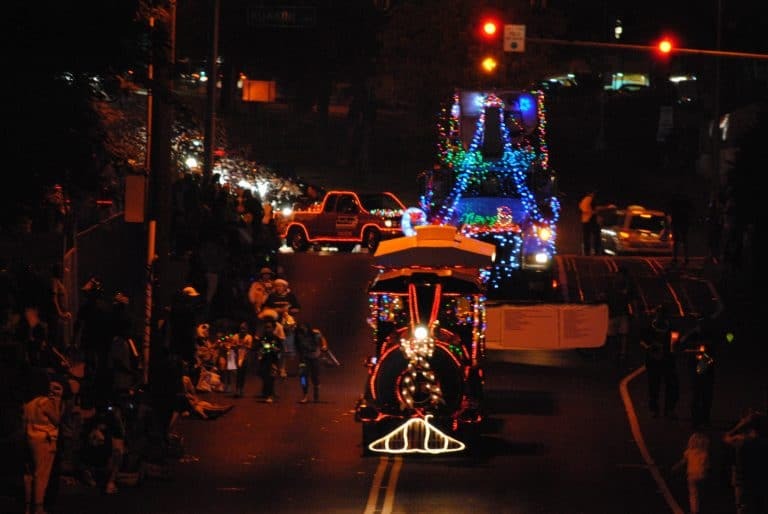 The Waimea Lighted Christmas Parade is a great way to kick off an island holiday break. Held on December 1st, the parade begins at Waimea Canyon Park and heads down Kaumualii Highway to Ala Wai Road, turning inland then back west to end in the center of town. After-parade festivities at Hofgaard Park include live music and baked goods. Find the best deals on hotels on Kauai. Look for amazing deals on hotels on Lana’i. So many fun ideas! Thanks for sharing. This looks fun. I spent my holiday seeing some shows in Christmas Family Fest. The kids love the performances.